You and your spouse or partner are ready to apply for a mortgage loan. It makes sense to apply for the loan jointly, right? That way, your lender can use your combined incomes when determining how much mortgage money it can lend you. Surprisingly, this isn't always the right approach. If the three-digit credit score of your spouse or partner is too low, it might make sense to apply for a mortgage loan on your own — as long as your income alone is high enough to let you qualify. That's because it doesn't matter how high your credit score is if your spouse's is low. Your lender will look at your spouse's score, and not yours, when deciding if you and your partner qualify for a home loan. "If one spouse has a low credit score, and that credit score is so low that the couple will either have to pay a higher interest rate or might not qualify for every loan product out there, then it might be time to consider dropping that spouse from the loan application," says Eric Rotner, vice president of mortgage banking at the Scottsdale, Arizona office of Commerce Home Mortgage. "If a score is below a certain point, it can really limit your options." Lenders rely heavily on credit scores today, using them to determine the interest rates they charge borrowers and whether they'll even approve their clients for a mortgage loan. Lenders consider a FICO score of 740 or higher to be a strong one, and will usually reserve their lowest interest rates for borrowers with such scores. Borrowers whose scores are too low — say under 640 on the FICO scale — will struggle to qualify for mortgage loans without having to pay higher interest rates. They might not be able to qualify for any loan at all, depending on how low their score is. When couples apply for a mortgage loan together, lenders don't consider all scores. Instead, they focus on the borrower who has the lowest credit score. Every borrower has three FICO credit scores — one each compiled by the three national credit bureaus, TransUnion, Experian, and Equifax. Each of these scores can be slightly different. When couples apply for a mortgage loan, lenders will only consider the lowest middle credit score between the applicants. Say you have credit scores of 740, 780, and 760 from the three credit bureaus. Your spouse has scores of 640, 620, and 610. Your lender will use that 620 score only when determining how likely you are to make your loan payments on time. Many lenders will consider a score of 620 to be too risky, and won't approve your loan application. Others will approve you, but only at a high interest rate. In such a case, it might make sense to drop a spouse from the loan application. "If you are the sole breadwinner, and your spouse's credit score is low, it usually makes sense to apply in your name only for the mortgage loan," said Mike Kinane, senior vice president of consumer lending at the Mt. Laurel, New Jersey office of TD Bank. "But your income will need to be enough to support the mortgage you are looking for." That's the tricky part: If you drop a spouse from a loan application, you won't be penalized for that spouse's weak credit score. But you also can't use that spouse's income. You might need to apply for a smaller mortgage loan, which usually means buying a smaller home, too. There are other times when it makes sense for one spouse to sit out the loan application process. If one spouse has too much debt and not enough income, it can be smart to leave that spouse out of the loan process. Lenders typically want your total monthly debts — including your estimated new monthly mortgage payment — to equal no more than 43% of your gross monthly income. If your spouse's debt is high enough to throw this ratio out of whack, applying alone might be the wise choice. Spouses or partners with past foreclosures, bankruptcies, or short sales on their credit reports might stay away from the loan application, too. Those negative judgments could make it more difficult to qualify for a loan. Again, it comes down to simple math: Does the benefit of skipping your partner's low credit score, high debt levels, and negative judgments outweigh the negative of not being able to use that spouse's income? "The $64,000 question is whether the spouse with the bad credit score is the breadwinner for the couple," says David Reiss, professor of law with Brooklyn Law School in Brooklyn, New York. "The best case scenario would be a couple where the breadwinner is also the one with the good credit score. Dropping the other spouse from the application is likely a no-brainer in that circumstance. And of course, there will be a gray area for a couple where both spouses bring in a significant share of the income. In that case, the couple should definitely shop around for lenders that can work with them." 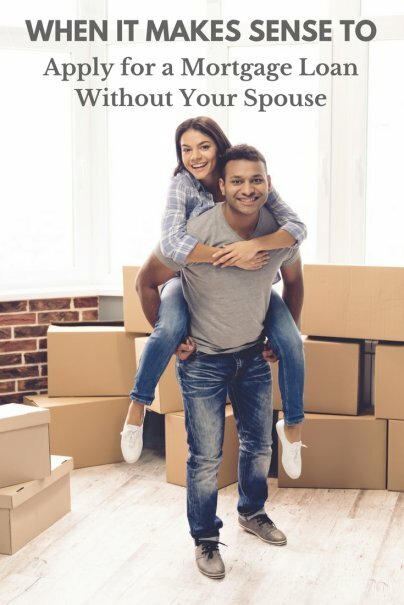 Spouses or partners might worry that not having their names on the mortgage loan application means that they don't have an equal ownership stake in the home. Rotner says that couples just have to put both names on the home's title. If they do that, both will have equal ownership of the home, no matter whose names are on the mortgage loan. "Title expresses ownership in a property," Rotner says. "Being on the mortgage loan expresses a financial obligation to the property. There is a difference." Partners might have one other concern about being left off the mortgage loan: It will be more difficult for them to boost their weak credit scores. Every time consumers make their mortgage loan payments on time, it helps their credit scores. But partners whose names aren't on the mortgage loan won't see any benefit from on-time payments, even if their income is helping to pay the mortgage bill each month. "That is a valid concern," Rotner said. "But what is the trade-off? You either get to buy a home that you couldn't otherwise buy or you get a 700 credit score. What is more important?" Are you and your spouse both on the mortgage? What about the title? Great post. A related complication. An offer came in on a home. The prospective buyer is married but only the wife's signature is on the offer. The buyer's agent "says" the husband's credit is bad so the wife has to buy the house "sole and separate" to get the loan. This is a red flag for the seller, at least in community property states. One spouse's signature on an offer is a "buyer can cancel the contract at the last minute with no penalty" clause. The seller is likely to ask the buyer to produce a "Disclaimer Deed" from the prospective non-owner spouse within few days of contract acceptance. Without the Disclaimer Deed, the wife could cancel the contract anytime by saying, "Oh yeah, my husband said he would sign the Disclaimer Deed but he changed his mind and now the mortgage company won't give us a loan without it, I'm sorry, I know you already moved out of the house and bought another house, but I have to cancel the contract to buy your house because I couldn't get the loan." Maybe it's desirable to take out the mortgage in one name, but when we applied and tried to do this last year because my spouse's credit is so bad, all the lenders we spoke to refused to even consider allowing us to take the loan in only one name. The reason, they said, was that if the borrower should default or be unable to pay the loan, they needed the right to come after the other spouse for payment. my partner has applied for a mortgage in the south of ireland. I have not been mentioned in the application due to previous poor credit. When we met with the solictor for him to sign the mortgage agreement and apply for the small mortgage needed (as we have a substantial deposit) we were advised I needed to fill out declaration to state I would not pursue any money before bank in the even he defaulted on the mortgage. Our concern is the mortgage applaicaiton was already soley in his name and I have not been mentioned through it due to it all being in his name. Could the bank then withdraw the mortage application based on me moving in? ?